It is evident here that sometime in the last few years there was a huge mortality of the large corals. Similar views to be seen in varying degrees off Nelson, three brothers and now here around Eagle Island. It is possible that this could be down to a crown of thorns starfish plague or due to a bleaching event. No one can tell for sure as there is no year round monitoring of these sites. What is reassuring though is that the fish life is still thriving and that the level of recruitment of new juvenile coral settlers is very high. Because the fish are still here they graze the algae on the substrate ensuring that it is clear and available for new microscopic coral larvae to settle. The ones that I have been able to see growing in small mushroom like clumps all over dead coral skeletons are already a year or two old. 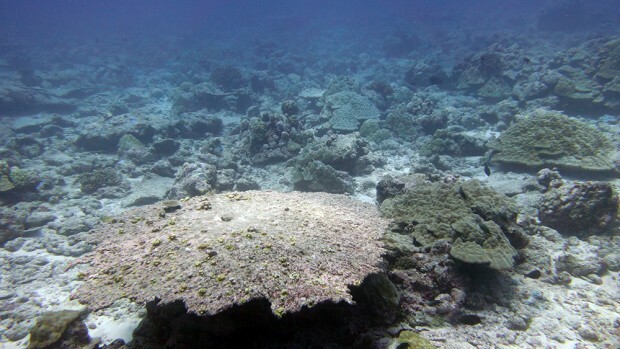 So in due course the reefs will quite likely recover here as they have done from other mortality events such as the mass coral bleaching event in 1998. There were some special sights to see despite the lack of extensive coral cover – a small whip coral turned up the first commensal whip coral shrimp that I have seen in the Chagos. 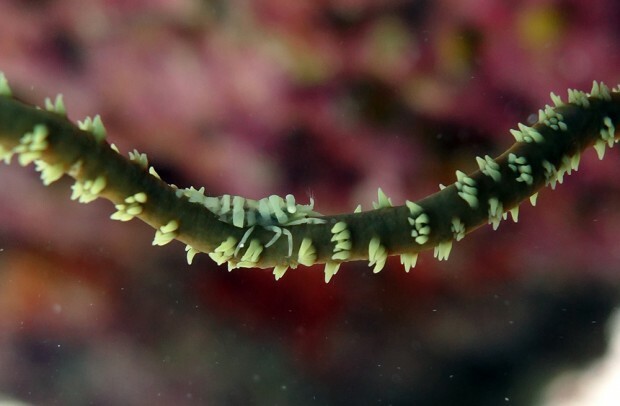 A lovely little light green specimen neatly camouflaged in the same colours as the whip coral to which he clung. On a completely different scale was the huge green turtle that wafted in from the blue before warily skirting around us. Or the porites bommie that obviously escaped the mortality event and was an incredible 8 meters or more in diameter. An ancient massive coral. 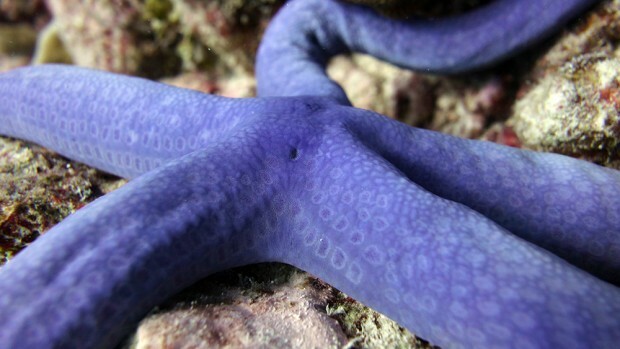 A great number of sea stars could also be seen draped over the seabed in various striking hues. Some of them had evidence of predation – and also their remarkable ability to regenerate arms when they have been bitten off. The light blue species was sizable reaching a diameter of at least 40 cm. 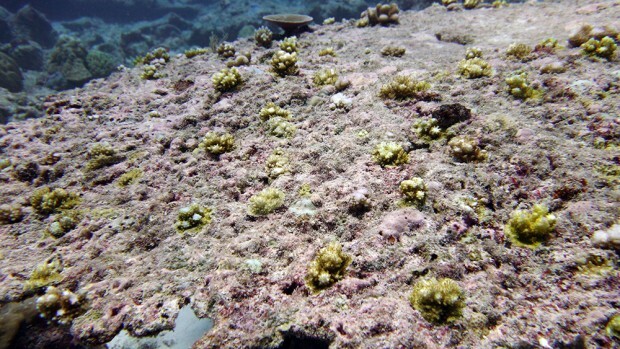 Adding further colour was a fluorescent pink species of porites coral that encrusted patches of rock. Eye catching but I suspect a step too far even for the shape shifting chameleon colour changing octopus. An individual we spotted toward the end of our dive initially put on a display to try and scare us off. Flaring his mantle and turning a stark white. When this didn’t deter us he shifted to a dark brown colour and mottled his skin. Quite remarkable to watch them as they mould themselves across the environs of the reef – becoming a part of it as they move across it. So although the corals have had a knock here it is evident that the reefs are still very much alive – it will be interesting to monitor this place consistently in the coming years to see how the corals recover. Tonight I’ll be heading ashore on to Sea Cow Island with Pete to continue our surveys of the Coconut Crab populations around the archipelago…more to report on that tomorrow!